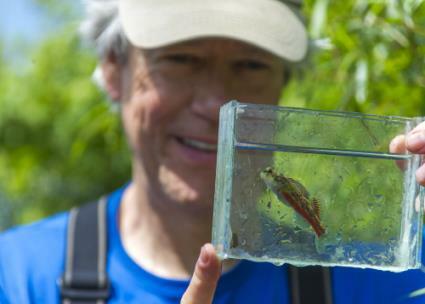 Dr. Bernie Kuhajda holds a critically endangered Vermilion Darter in Pinson, AL. This brightly-colored fish lives on the edge of the Birmingham, Al., metropolitan area with a population of more than 1.1 million people. 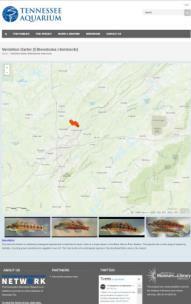 Screen capture of Vermilion Darter information as displayed on the Freshwater Information Network. Despite the unparalleled diversity of aquatic life in the Southeast, the millions of people who make use of the region’s rivers, lakes and streams may have no idea how many species they share the water with. When it comes to inspiring others to protect the Southeast’s underwater rainforest, lack of awareness is a serious problem, says Dr. Bernie Kuhajda, the science program manager at the Tennessee Aquarium Conservation Institute. 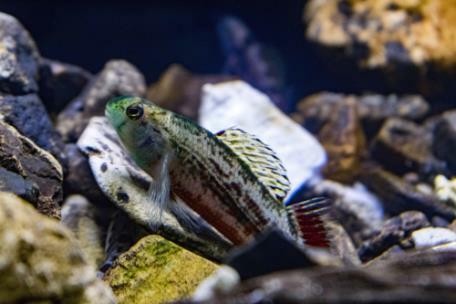 With the launch of the Freshwater Information Network (FIN), the Aquarium aims to help Southeasterners get to know the aquatic animals in their own neighborhood a little better. FIN is a searchable database of scientific records, based on museum specimens as well as fish photos taken by citizens and scientists for more than 400 native fish species. 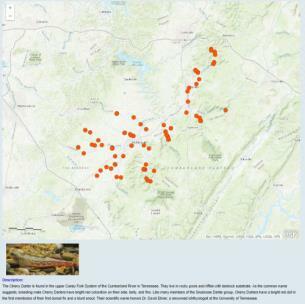 Partners at the iCube at Tennessee Technological University helped create a website where users can search by specific address, watershed or species. With a few clicks, anyone can discover which fish have been found in more than 75 watersheds spanning eight states. The database currently covers the biologically rich Tennessee, Cumberland and Mobile drainage basins. This tiny region is home to 46 percent of the fish species found in the United and Canada, even though the area is just 1.4 percent of that vast landmass. Development of the network was made possible by a 2015 grant through the Institute of Library and Museum Services’ Museums for America program. In the past, scientists have relied on collections of preserved specimens housed at museums and academic institutions to serve as verified records of where a species has been found. FIN makes this information easily accessible and more efficient to update. FIN facilitates sound science without impacting living populations by using photo vouchers, especially those of imperiled species. The network is accessible to the public. Users of the site are encouraged to submit photos of the fish they catch and where they were found. Each entry is reviewed by experts, and once a species is positively identified, a new record about the sighting will be added to FIN. The network is accessible to members of the public, and users of the site are encouraged to submit photos of the fish they catch and where they were found. Each entry is reviewed by scientists, and once a species is positively identified, information about the sighting is added to FIN. For scientists, the network offers the means to keep track of freshwater science throughout the region. By knowing where research and conservation work is occurring, Southeastern academics are able to make the best use of the limited resources available to study and protect species in the region, Dr. Kuhajda said. Ultimately, FIN’s creators say they hope the site improves the work of scientists— both professional and citizen — and inspires the public to value the natural riches that surround them.